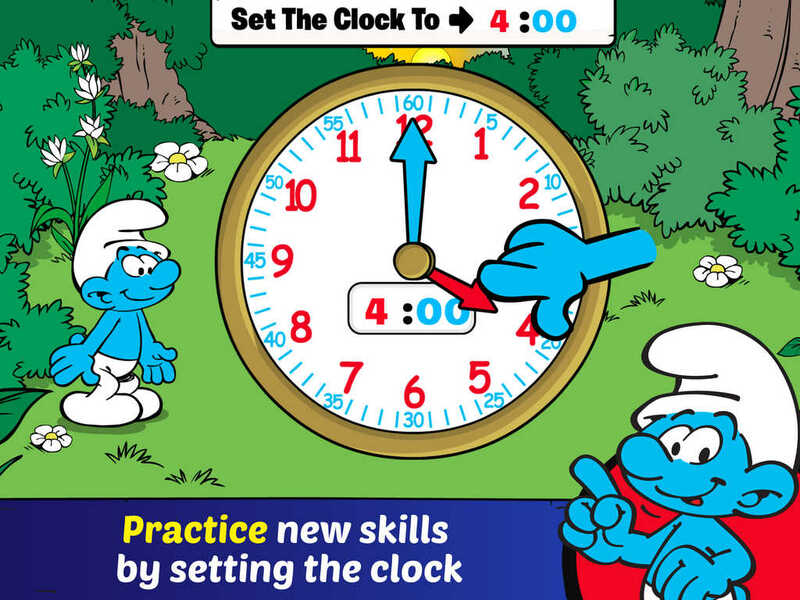 Telling Time with The Smurfs is more than a storybook app with great educational activities. Simply put, it’s an overall educational experience that children will love. It not only has a fun story to enjoy, but also lots of ways for children to learn and practice telling time with an easy to use interface. This is one app that is not only full of awesome educational and entertaining material, but it is also organized in a very easy to use way. With 4 separate options including Learn, Read, Practice, and Play, children can easily decide which section they would like to explore. With simple tap and swipe technology, this app allows children to easily move between activities and set the time on the clock with ease. It is also full of great illustrations, music, and sound effects that add to the over all experience making this one high quality app. Children are not only going to be able to learn how to tell time with this app, but they can also practice their reading skills with the text highlighting that is included in the story portion of the app. There is a Learn section that allows children to follow along as they are taught what the short and long hands on the clock mean. As they move through the tutorial, they get to practice setting the clock accordingly. This concept is then used in the story itself providing a fun way for children to engage with the story and practice what they’ve learned. There is also a practice portion of the app that allows children to get more practice setting the time. Throughout the mercies there is question mark button that provides a bit of extra help for children by including a faint template to follow to set the time correctly which is great for children just learning. In addition to the wonderful story that takes children through the day in the life of a Smurf, there is also an additional game that children can enjoy. The “Play” option of the app offers two difficulty levels for children to play. One requires children to simply select the correct clock, while the other requires players to tap the screen to fly to the correct option. In this game, children are provided the digital time and they are to select the clock that has the correct time on it. This game is not only lots of fun to play, but it also gives players a fun way to test what they have learned. It’s hard to believe that an app with so much educational and entertainment value is priced so low. For just under two dollars this app teaches children how to tell time, provides a tutorial, a fun storybook, and a game to practice what they’ve learned. Parents are definitely going to appreciate all that this app has to offer in addition to the awesome price. The developers have done a great job creating an app that is easy to use and child-friendly. With simple tap and touch technology, help buttons, and the tutorial to teach children how to tell time, this app is one that is very intuitive and great for children of all ages. The activities are organized well allowing children to easily access each without a ton of help from parents which is great.